Goodbye drying-out powders. Goodbye harsh cleansers. Powder has been a beauty staple for all mankind, from women looking to “powder their nose” to drying babies’ bottoms. 1) It is GENTLE. The texture is fine, soft and it blends and sits on the face like your second skin. 2) It keeps your skin OIL-FREE. We are total geeks when it comes to products and testing and analysis… so we put the pros and cons on a simple chart. Clearly, based on this analysis, the dream would be to have the best of both worlds. 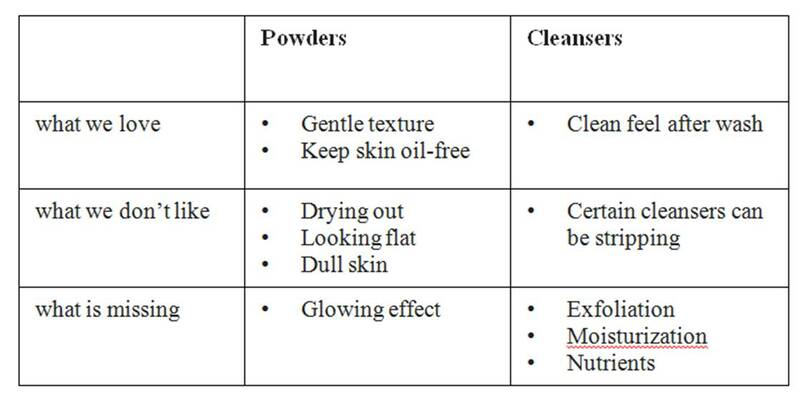 Best of all, because you have custom control over powder cleansers. Create your own consistency of paste or light foam by adding droplets of water to powdered cleansers – and you can intensify or dial back the degree of exfoliation with each face wash — a great versatility to have for those sensitive skin days. Many liquid peels slough off dead skin cells to reveal brighter skin, but they can burn like the dickens in the process. This cleanser-meets-exfoliant rids the skin of dead cells by way of a fine-grain powder, fueled by a pineapple & papaya-based enzyme and other botanicals (like antioxidant green-tea-leaf extract). Step aside, Palcohol, there’s a new buzzworthy powder in town. And unlike you, it’s actually a good idea. I’m talking about powdered facial cleansers, a.k.a. my newest skin-care obsession. 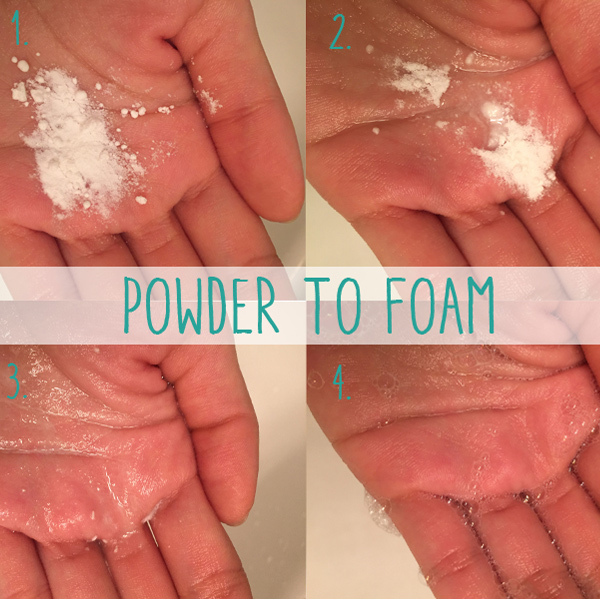 These formulas begin as chalky dusts (most of them have a baby-powder-like consistency) and transform into lightweight – sometimes sudsy – liquid cleansers when you mix in a little bit of water. Besides the nerdy-science-kid appeal of turning one substance into another, they’re also just really good. “Fine-grain powders seem to be the next hot thing in exfoliants. They are good for all skin types, and they’re especially good for sensitive or rosacea-prone skin,” says New York City dermatologist Francesca Fusco. Many of the formulas use pulverized minerals, botanical enzymes, and plant-based exfoliators to effectively but gently slough skin, so they’re also a useful substitute for your plastic-microbead-spiked scrub. 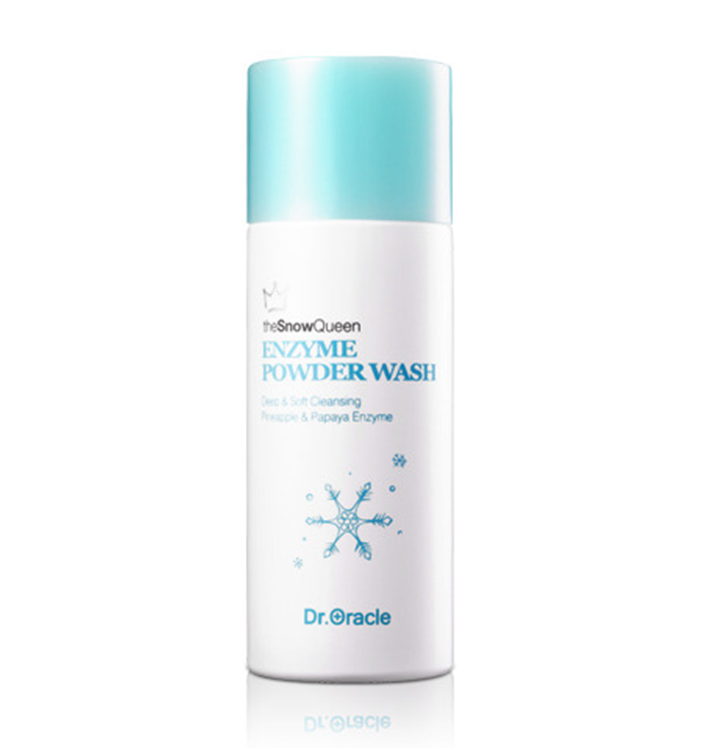 Powder cleansers have the power of a face scrub for a gentle formula any skin type can handle. All you need to do is mix it with as much or as little as you like before washing. Never again for post-exfoliation alligator skin. Oils and conditioners within the powder itself will soften and smooth by adding moisture immediately back into your skin. That said, using the product at a thicker consistency will even out oil-prone skin and prevent the bacteria buildup that can cause breakouts. Dying to try this newest cleansing innovation from Korea? Enter our giveaway (open to international) below! We’re giving away 2 cleansers – winners will be announced 3/1/2015. Click here to access our Rafflecopter giveaway! Glad to hear, thanks @honeebs!